Ella Murphy, a resident of Darien, helped the Greens Farms Academy girls soccer team get off to a good start this season. It was another successful week for the Greens Farms Academy Dragons through all facets of their fall sports programs. From some early week victories to the GFA girls cross country posting its best finish in years, the Dragons are heading into the fall season strong. Caroline McCall (Westport) and Haley Nilsson (Fairfield) both notched top 10 finishes at Saturday’s Canterbury Invitational cross country meet . Buoyed by those strong finishes the GFA girls placed fourth out of 15 teams. The boys, led by Larson Palmgren’s (Fairfield) 26th place finish, placed 10th out of 19 teams. In the girls varsity race, McCall finished fifth in 20:29. Nilsson was seventh in 21:09. Kira McCreesh (Southport) was 21st (23:23), Georgia Palmgren (Fairfield) was 31st (24:13), Katie Gabriele (Westport) was 51st (25:44) and Kaitlin Reed (Southport) was 56th (26:08). A total of 105 runners competed in the girls race. On the boys side, Palmgren was 26th (19:29), Will Magrone (Darien) was 49th (20:21), Owen Minson (Darien) was 52nd (20:32), Connor Minson (Darien) was 55th (20:35), Oliver Diamond (Rowayton) was 81st (21:59), and Jackson Rassias (Fairfield) was 124th (25:40). A total of 128 runners took part. The Dragons improved to 4-0 on the season with a pair of wins last week. The week started with a 25-20, 25-19, 20-25, 25-7 win on the road at The Master's School on Monday. Kirwan Carey (Westport) had 15 kills for GFA while Elena Mota (Darien) added eight. Carey also had seven blocks. Meg Nesi (Fairfield) had 15 assists while Alex Nason (Darien) had 13 digs and Mota had eight digs. Kelly Mooney (Southport) tallied five aces while Nesi and Jessica Cramer (Wilton) had three each. The Dragons remained undefeated this season with a 3-1 in over Cheshire Academy on Saturday. GFA won the match 25-12, 25-20, 23-25, 25-19. Carey had 12 kills, nine blocks, eight digs and four aces for the Dragons while Mota added eight kills, seven digs and four aces. Nason had five digs while Nesi had four digs to go with 12 assists. The Dragons improved to 2-0 on the season with a big 9-0 win over Cheshire Academy. Lucy Holzinger (Westport), Zoe Koskinas (Fairfield), Francesca DeVita (Darien) and Lucy Nelson (Westport) all scored two goals each to lead the GFA offense. Keely O'Shea (Darien) also had a goal and an assist. Holzinger added two assists while Koskinas had one. The Dragons scored four goals in the first half and added five more in the second while outshooting CA by a 40-0 tally. GFA goalie Nikki Farber (Westport) went untested in the game. Ethan Lior (Fairfield) had both goals to lead the Greens Farms Academy boys soccer team to a 2-0 win over Marianapolis Prep on Saturday. It was GFA’s first win against one loss and two ties. Max Yates (Fairfield) stopped seven shots for the Dragons, including three on one scoring chance to keep the Dragons in the lead with the momentum. GFA out-shot Prep by a 21-8 tally. Earlier in the week, the Dragons stormed back from a two-goal deficit to earn a 2-2 tie with Cheshire Academy on Thursday. After falling behind 2-0, Will Whelan (Fairfield) tallied a goal in the 39th minute to bring the Dragons to within one before halftime. It was Liam Murphy (Westport) tying the game in the 68th minute as the Dragons moved notched their second tie of the season. Yates made seven saves for GFA, which was outshot by just a 14-13 total. 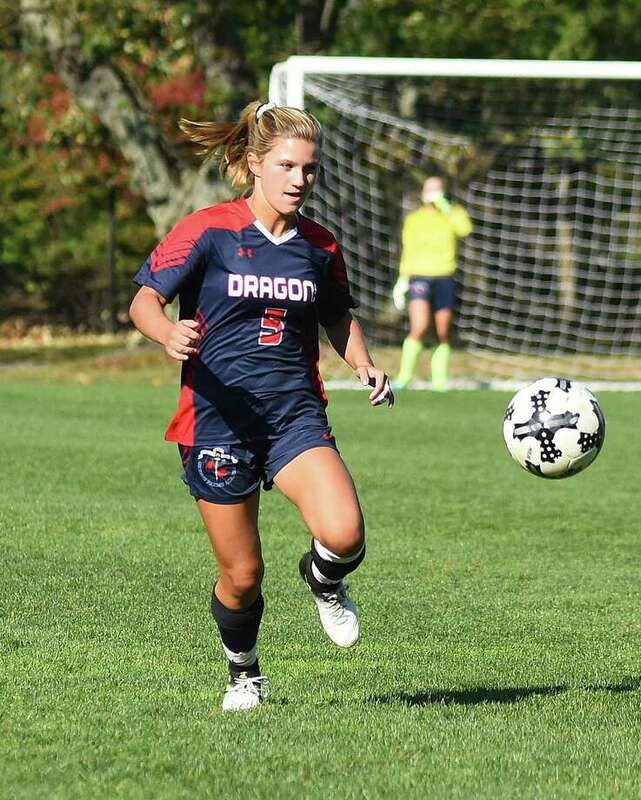 Ella Murphy (Darien) scored off a Sophie Staeger (Southport) assist as the Dragons earned a 1-1 tie with Cheshire Academy on Monday on the turf in Westport. The Dragons took the 1-0 lead, but Cheshire Academy tied the game six minutes later. For GFA, goalkeeper Marygrace Dellisanti (Wilton) had four saves. Later in the week, the Dragons fell on the road by a 3-1 score to St. Luke's. Staeger scored GFA's lone goal while Dellisanti stopped seven shots.